Child welfare agencies are interested in leveraging new and emerging techniques to help them harness data and technology to make dramatic improvements to child welfare practice and ultimately produce better outcomes for children and families. 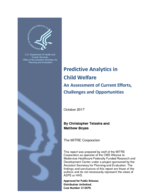 This document explores the state of the use of predictive analytics in child welfare by conducting an environmental scan of child welfare agencies, academia, nonprofit organizations, and for-profit vendors. Topics discussed in qualitative interviews included how each jurisdiction uses predictive analytics to support child welfare practice, the challenges that motivated using predictive analytics, and the challenges faced as these agencies have begun their modeling efforts. Whether motivated by an unfortunate event or a directive to improve performance on a certain metric, agencies recognize that multiple problems may need to be tackled to obtain the full benefit of predictive analytics.